Grandpa has been busy replacing the floor on our deck. 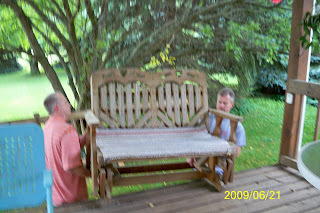 Sunday the men in our family helped by taking off the wood gliders and deck railings. Sorry about the blurry pictures but that was caused by the photographer. Me!!! 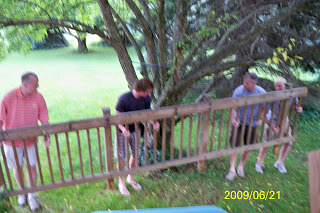 In the pictures are John our son, Tim our son-in-law removing the big glider. 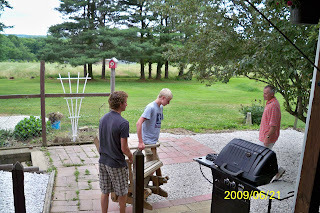 Our grandsons Kyle and Michael removed the smaller one. I received a blessing today by receiving a phone call from our granddaughter, Erica. It's so nice to be thought of in such a nice way. Thank you Erica. Looks like fun work. I'm not one for gardening and landscaping, but most other forms of manual labor I tend to enjoy, as odd as that might be.